We manufacture luxury period and atypical lighting fittings (chandeliers, lantern, lamps, sconces, wall lamps and candleholders – Venetian, from the time of Maria Teresa, Dutch, basket etc.). We sell restored original antique lighting fittings and restore lamps and metal objects from historical buildings. We hold the License of the Ministry of Culture of the Czech Republic. The company was founded by Martin Ferebauer in Telc in 1853. It mainly produced lanterns and lamps for coaches. Later it extended its production with various types of lamps and the company moved to Brno. In the fifties of the last century (when the company was closed down by the communists) its owners concentrated on research, restoration and not only manufactured precise copies of lamps but also period jewels. In 1967 they manufactured the gift to the King of Sweden for the Ministry of Culture and the Czechoslovak Academy of Sciences, in 1971 the gift to the Queen of England and in the same year the gift to the Pope. Since 1990, we have been the holder of the License of the Ministry of Culture for Arts and Crafts for restoring and manufacturing works of art that are considered cultural heritage. 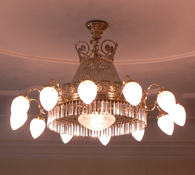 Also in 1990, the company reassumed its operation and continued its tradition in customized manufacture of atypical and luxury lighting fittings. Our company manufactures lighting fittings such as chandeliers, sconces, wall lamps, lamps, lantern lamp posts and other types of lighting fittings and also restores antique lamps and manufactures precise copies of various types of period lighting fittings. Lighting fittings are made to order to fit our client’s interior. It is an individual production. Each lamp is always an original. We design and manufacture the lights to correspond with the architectural style of the building, that is the case of castles, palaces or other historical buildings, and place a particular emphasis on the purity of the style even if the piece is not a replica. Moreover lights are designed to match the furniture or other fixtures and fittings in the building as required by the client. Our portfolio is focused on demanding clients who wish to have original lighting fittings of a high quality. We also offer our clients to furnish their interiors with restored originals of antique lights and lamps or replicas of period lighting fittings. These can be, at the clients request, electrified and provided with an audit report; which applies to all lighting fittings of our production. » Are you interested in our services?